We have compiled documentation of a selected few butterfly species we have encounted so far in Ithaca, New York. Things have been quite hectic since coming to Ithaca, New York so we have not had the time to properly document every species we encounter each day, nor have we been able to keep up with some of the things we have been doing with them. This post compiles a few random butterfly species that we collected over the past week because it would be pointless to make several smaller posts and because no pictures were ever taken for the majority of things we saw or caught. 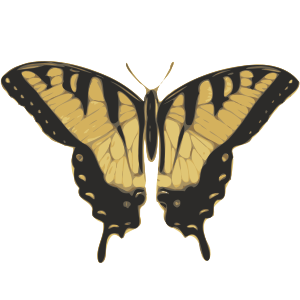 Moving in chronological order that the pictures were taken, the first species is Papilio cresphontes. We have been seeing tons of these swallowtails; they are perhaps the most common butterfly after skipper species, cabbage whites, and monarchs. We were able to capture several females since coming to Ithaca, but none of them laid any eggs. About half of them died before we even got a real chance to set them up because they were already so worn down and weak when we caught them (almost none of them had a complete set of legs. . . ). The set up that we used consisted of rue cuttings in a laundry bag left outside in open sun. Females were fed as much as possible, but it was difficult to get them to fatten up when they were so skinny to begin with. After up to two or three days of zero reaction to the rue, we would give up on the female. The second species here is monarch (Danaus plexippus). We didn't really know what to expect with these up here in the North, but as it turns out they don't seem to be any less common than back in Albany, California. In fact, they may be even more common at this time of year based on the fact that we are seeing them almost everyday, sometimes even around urban areas. An interesting thing to note is that the monarchs here definitely seem to be smaller in size than the ones back home. Number three is the great spangled fritillary (Speyeria cybele). These are somewhat rare even though it would make sense that they would be flying strong right now, spilling the eggs right before it gets cold because the first instar larva in the overwintering stage. So far, we have already managed to catch two females. We had set the first one up in a tub with nothing in it, hoping that it would lay without any extra help because they supposedly quite careless about where they do it in the wild (by that I mean not necessarily laying on the host plant but if not, usually still in close proximity). Unfortunately, it did not lay at all and died after several days of starvation on the day that we finally found a source for violets (Viola) and brought some home. By this time, we had captured a second female that did lay an egg or two on the violet before losing all interest for no apparent reason other than it seemed to be getting weak. We blame this on our lack of patience initially in trying to get the butterflies to feed. We have found out the hard way that this species takes an awfully long time (sometime several minutes of struggling) to realize that there is food, even after we force the proboscis into honey-water. With any other species, we would automatically assume by the end of 30-60 seconds of resistance that the thing just isn't hungry. On the same day and exact location (butterfly bush [Buddleja] at Cornell Botanic Garden) that we caught the first Speyeria, we also caught two American ladies (Vanessa virginiensis). Our initial thought was actually that we had painted ladies (Vanessa cardui), but these are much smaller and have much larger spots on the hindwings. This is our first time seeing virginiensis, even though they are also supposed to fly in Alameda County, California. So far, this is the only Vanessa​ species in Ithaca. The last species that this post includes is the orange sulphur (Colias eurytheme). When we first got here and saw all these white butterflies dashing around the grassy, wildflower areas we almost puked thinking that the cabbage white (Pieris rapae) would still be the most common and boring species all the way across the country. As it turns out, most of them are indeed cabbages, but in certain areas, they are sulfurs (the sad part is that sulfurs are also supposed to be common on the west, but they are some of the rarest sights back at home where there are a tiny fraction of the number of insects compared to Ithaca). The most common habitat for these is on open, grassy fields (literally grass in this case) with little flowers. We sometimes see half a dozen C. philodice and occasionally C. eurytheme. There are usually both males and females there, including a few white form females like the one in the picture. The things fly incredibly fast and are impossible to catch even when landed because they are so sensitive to movement. Although they are not pictures in this post, we thought it would be appropriate to discuss the endings of our female Papilio troilus and female Limenitis arthemis astyanax​. We did not get spicebush (Lindera benzoin) until a week after capturing the female and by that time, the weather was not good for egg laying at all. We attempted to set it up, but we could not get any activity out of the female whatsoever even though it was extremely plump and still decently strong. Because spicebush cuttings dry out so fast, we were struggling to keep up the setup and eventually, we tried bringing her to the live plants at Mundy Wildflower Garden and putting her in a laundry bag, but there was still no sun at all. After a while, it became apparent that she was still not at all interested in laying. It was just as well, then, that we accidentally let her get away. As for the Limenitis, we never got around to making a very good setup because we lack host plants (we also don't know what host plants they really like here) and the first one we caught got away after the laundry bag it was in got knocked over sometime during the afternoon that we were out collecting. The second female we caught was almost dead when we caught it so we never got a chance at all with her.